1- It's possible to embed in my pages ? Do you have a sample code? 2- I passed dynamically my pdf to on line annotator . I need a way to have back a link or a file after save annotations. Do you have some suggestion? "ReturnURL" is a web page on your server which able to receive the annotated PDF file. "ReturnID" is an unique ID for this PDF file. 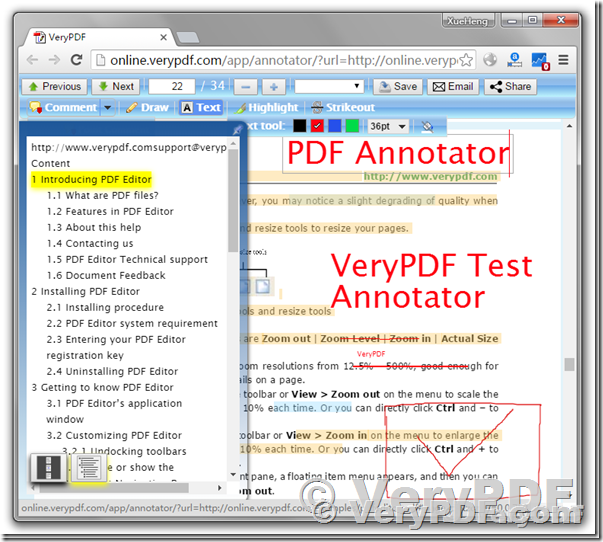 Hi, it seems Online PDF Annotator is slowing, we are evaluating your products for a new app we are developing. But we need some stable solution. Have you something for this? After you purchase "HTML5 PDF Annotation Source Code License", you can deploy it to your owned server, then you can provide the PDF Annotation Service to your users easily. forth; just edit an existing .PCL overlay and make some changes. 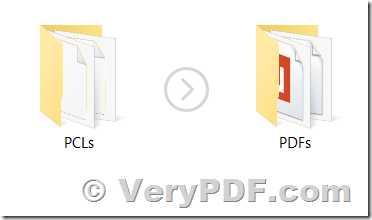 Do you have a PCL editor? If you have any question for these products, please feel free to let us know, we are glad to assist you asap. VeryPDF PDF to Any Converter SDK is a DLL Library for developers, if you wish convert from PDF files to Word, Excel, PowerPoint, HTML, XML, PostScript, EPS, plain text and image, like TIFF, JPEG, TGA, PNG, GIF, BMP, and PNM (PPM, PBM, and PPM) etc. 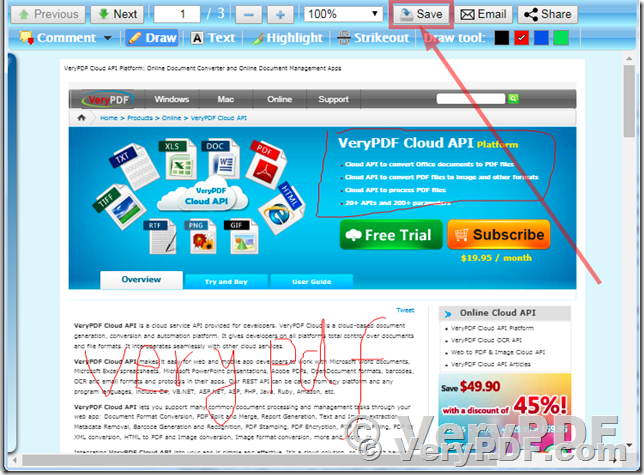 formats, VeryPDF PDF to Any Converter SDK will be your best choice. You can integrate PDF to Any Converter SDK into your application easily, you can convert PDF to 20+ formats with just a few code lines. 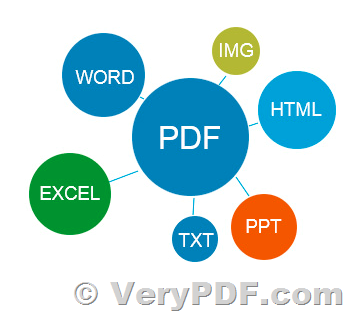 If you encounter any problem with PDF to Any Converter SDK, please feel free to let us know, we will assist you asap. 1- It's possible to embed in my pages? Do you have a sample code? 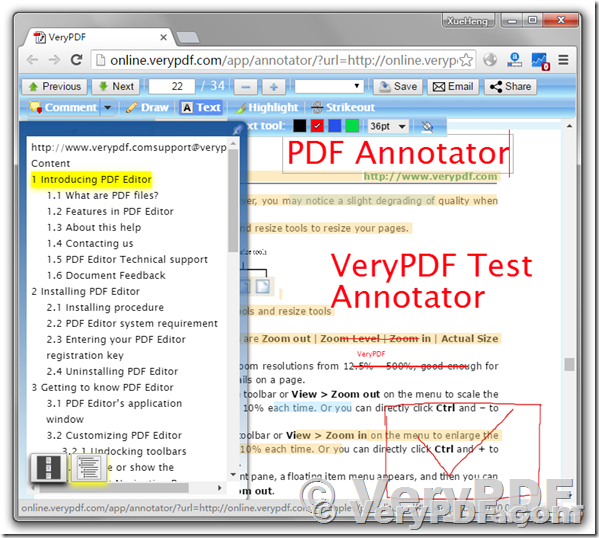 2- I passed dynamically my pdf to on line annotator. I need a way to have back a link or a file after save annotations. Do you have some suggestion? Is there any chance to get an actual version of "PDF2Image". We need support for pdf containing fillable fields. 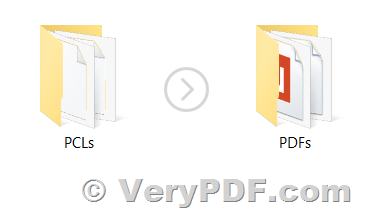 If you encounter any problem with the latest version of PDF to Image Converter Command Line software, please feel free send to us your sample PDF files for test purpose, after we test your PDF file in our system, we will figure out a solution to you asap. No, also this newest version of PDF2Image doesn't support pdf with fillable fields. 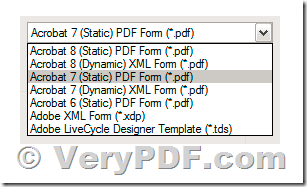 If you wish convert these Dynamic XFA forms to Static Page Contents in PDF file, you need to open this PDF file in Adobe's LiveCycle Designer, save it to a new PDF file with "Adobe Static PDF Form (*.pdf)" option, then you will get a new PDF file with static form contents. 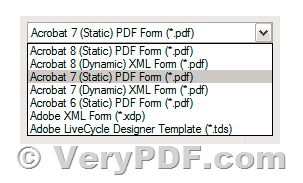 If you are using Adobe LiveCycle, you should better save the final PDF as a static form compatible with Acrobat 7. pdf2img.exe does support Acrobat 7 Static PDF Forms perfectly. If you have Adobe Acrobat installed in your system, and you have lots of PDF files with dynamic forms, we can write a software for you to convert from all dynamic XFA PDF forms to static forms in PDF files, if you are interest in this solution, please feel free to let us know, we will try to figure out a solution to you shortly.